A New England getaway to The Chanler means being within walking distance to the classic Newport Mansions. As one of the only Newport mansion hotels on the famed Cliff Walk, guests are front-and-center to these incredible Rhode Island landmarks, rewarded with a unique experience not found at any other Newport hotel. 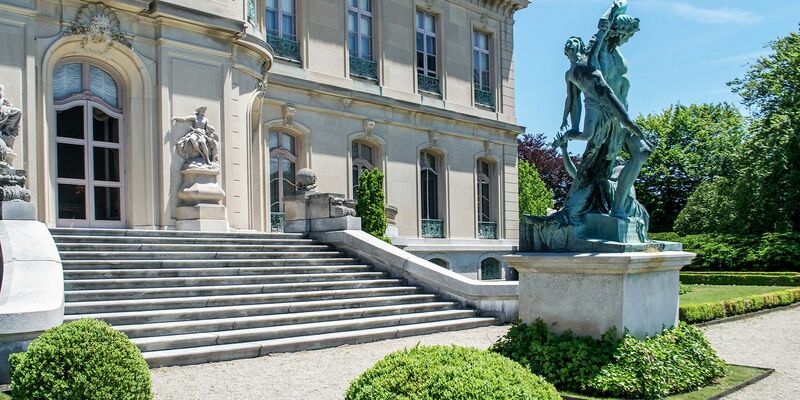 Our concerige at The Chanler is happy to book Mansion tickets and arrange private tours for you. Spanning more than 300 years of significant contributions to architecture, the fabric of Newport is reflected in the Newport Mansions. These grand houses display rich collections of fine décor, including Colonial American furniture, decorative Chinese porcelains and romantic European paintings. These majestic mansions not only offer insight into the timeless elegance that Newport has to offer, but also showcase some of the most lush landscapes in New England, an integral part of the community’s scenic beauty. At all of the 10 historic properties maintained by The Preservation Society of Newport County, and Doris Duke's mansion with the Newport Restoration Foundation, you’ll encounter 300 years of American history on over 80 acres of gardens and parks. Before you experience the journey yourself, learn about all of the Newport mansions below to delight in what each has to offer. Home of the philanthropist and enigmatic heiress Doris Duke, Rough Point is an English manorial style mansion filled with art and furniture collected on many of Duke's travels to exotic places around the world. Rough Point provides a glimpse into the life of a complex woman who defied convention and embraced a passionate lifestyle. 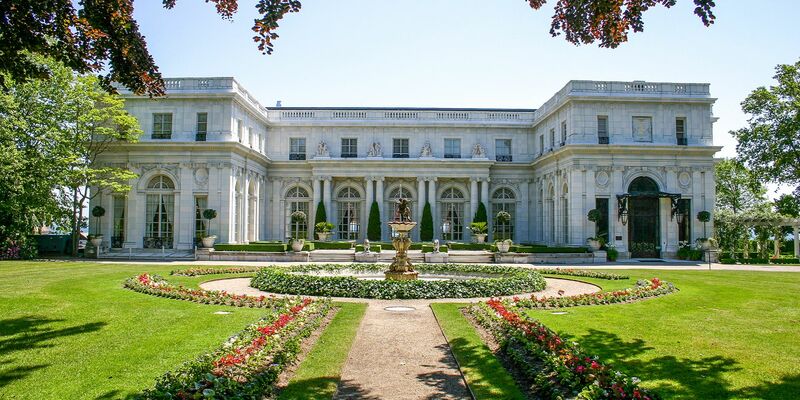 As a symbol of the Vanderbilt family’s social and financial prominence, The Breakers is the grandest of Newport’s summer “cottages,” with 70 rooms totaling 138,300 square feet. Intended as an ultimate statement of Gilded Age privilege, Marble House contains 500,000 cubic feet of marble, and was completed in 1892 for Mr. and Mrs. William K. Vanderbilt. The Elms was completed in 1901 at a cost of approximately $1.4 million for Mr. and Mrs. Edward Julius Berwind of Philadelphia and New York. The interior features a collection of Renaissance ceramics and Venetian paintings while the exterior grounds feature marble and bronze sculptures and a picturesque sunken garden. Nevada silver heiress Theresa Fair Oelrichs hosted some of Newport's most lavish parties here, including a 'White Ball' in 1904 that featured replicas of white ships anchored offshore as a backdrop. It has also been a set for many Hollywood films, including "The Great Gatsby," "True Lies," and "27 Dresses." This is one of America's greatest Victorian houses, completed in 1852, with hand-carved Italian woodwork, Chinese porcelains, Egyptian and Japanese Revival stenciled wallpapers, and rare trees from as far away as Mongolia. Built in 1841 in the Gothic Revival style, Kingscote contains one of America's greatest dining rooms, with Tiffany glass and a unique cork ceiling. Its furnishings reflect the King family's success as China Trade merchants. A masterpiece of the American shingle style, this house completed in 1883 features Arts and Crafts interiors, Japanese-inspired columns, and a sweeping open floor plan. One of the oldest and most northern topiary gardens in the country, this Victorian country estate features more than 80 fanciful sculpted shrubs in the shape of animals, teacups, spirals, and other geometric forms.. This Georgian Colonial house built before the American Revolution was the home of a merchant, ship owner, and colonial deputy, and later headquarters of the French navy during the Revolution. It houses a collection of exquisite colonial furniture by legendary Newport craftsmen. This charming Italianate-style villa built in 1861 reflects the mid-20th century style of its last owner, and houses a collection of important 19th century American paintings, including Hudson River landscapes. Explore the European refinement and timeless elegance associated with Newport’s historic district and visit the Newport Mansions today. Staying at the Chanler at Cliff Walk, a boutique waterfront hotel in Rhode Island is close to a variety of enchanting sites, including the mansions in Newport. Reserve a room today to take advantage of all there is to do in Newport.